A draft ceasefire agreement between the south Tripoli fighting militias was announced yesterday (Photo: Social media). 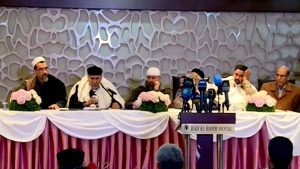 The draft terms of the ceasefire agreement ending the fighting between militias in the southern edges of Greater Tripoli were announced at a press conference yesterday. 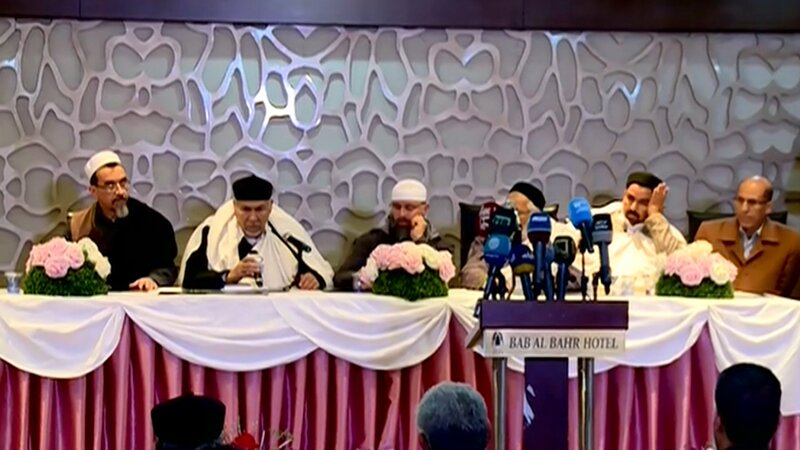 The 30-strong delegation of tribal elders from the Wirfala tribe and the Higher Council for Reconciliation in Tripoli reached what they hoped would be a permanent comprehensive reconciliation and ceasefire agreement between the fighting parties. The talks were held on Sunday at Tripoli’s Bab al-Bahr hotel. The Wirfala tribe elders had met with their counterparts in the city of Tarhuna on Friday. The agreement called for an immediate ceasefire and withdrawal of fighting militia forces to 15 kms from respective Greater Tripoli and Tarhuna boundaries. The vacated areas will be secured by local Serraj government aligned “official” security directorate forces. The two fighting militias will exchange prisoners and bodies and allow the internally displaced to return home. A ceasefire implementation committee will be formed to monitor the ceasefire. All roads will be reopened and road blocks will be removed. The agreement has yet to be approved officially by Tarhuna. Ironically, some exchange of fire took place today in the Sug il Khamis area with both sides blaming the other for restarting it, but this soon died out. It will be noted that the previous ceasefire in August 2018 between the coalition of Tripoli militias and the Tarhuna militias had been held in the city of Zawia and was brokered by UNSMIL. However, UNSMIL seems to have been sidelined on this occassion and was criticised by both fighting parties and indirectly blamed for the collapse of the ceasefire. Nevertheless, UNSMIL reported that yesterday its head Ghassan Salame phoned and thanked the all-Libyan group of mediators for their efforts. It will be recalled that fighting between the Tarhuna-based 7th Infantry Kani Brigade and the coalition of main Tripoli-based militias, the Tripoli Protection Force (TPF) started last Tuesday around the Tripoli International Airport site. The fighting led to 16 dead, including 4 civilians, and 65 injured. There were 213 families displaced.